The fortieth degree of latitude (N 40° 00’ 00”) runs across the center of the United States, from the New Jersey shoreline to California. I noticed that the road we drove up, Baseline Road went east in a straight line as far as I could see. I asked my friend if he knew why it was called this. He replied that it was the 40th parallel of latitude, and went on to explain that it was the baseline for creating townships and homesteads, and was a key marker to the settlement of the West. I had a project: I was going to document these arbitrary points of human measurement and the landscape found at the intersections. In 1998, Myren set off with his newly purchased GPS Magellan unit and his 8x10 Deardorff camera to traverse the country. The result of his travels (he is still traveling) is "The Fortieth Parallel," a series of panoramic photographs documenting points across the U.S. at exactly 40 degrees of latitude and at every longitude. The stunning stream of photographs captures a rich variety of landscape. As of this summer, Myren had photographed 32 of the 52 degree confluences (50 on land, 2 at landfall) and raised more than $15,000 to continue his project (by way of a successful Kickstarter campaign). Scroll through Myren's striking panoramic photographs in the slideshow below and let us know your thoughts in the comments section. 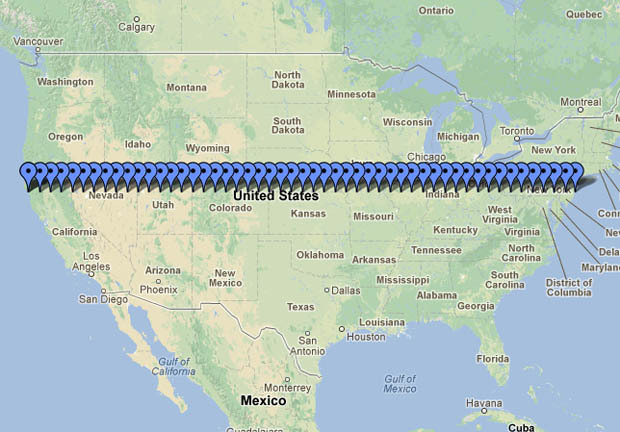 For more information on "The Fortieth Parallel," and Myren's other geographically inspired projects, visit his website. Bruce Myren - "The Fortieth Parallel"